I've been playing Stick, on and off, for more than two decades. This page is dedicated to the musical intrument and its players. 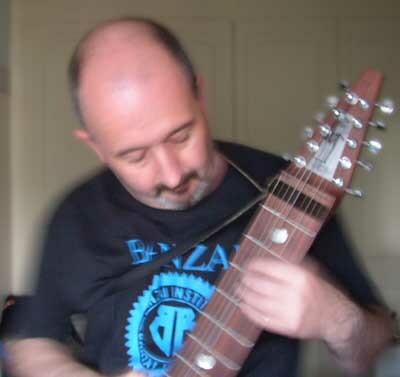 The first thing that people ask me when I mention that I play Chapman Stick, is "what on Earth's a Chapman Stick?". Fair enough - it's a good question, and it's not a musical instrument you see that often on MTV. As you can see, it's a stringed instrument, played in the most part by tapping the strings on to the fret board rather than by strumming them. The Stick has a musical range which drops below the lowest note on a bass guitar and rises to the same register as the high notes on an electric guitar, so you've got quite a few notes to play with. The Grand Stick looks pretty much the same, except for the fact that you have twelve strings to play with instead. It's not so much a case of picking up a Stick and playing it - it's more a case of putting it on. You wear it by hooking a clip into your belt, and looping the strap over your head and under one armpit, as you can see here. Then you can plug in your stereo cord, fire up your amps (one for the bass strings, one for the treble) and off you go. What does the Stick sound like? Well, the bass sound is very percussive, as you'd expect. Tony Levin used one a lot on Peter Gabriel's early albums: I Don't Remember from Peter Gabriel III is what I normally play to people and say "that's what a stick sounds like..." The first time I saw a Stick player on TV, it would have been Tony playing it, either with Peter Gabriel or with King Crimson. Then in 1983 when ITV's South Bank Show did a documentary on how Peter Gabriel recorded his fourth album, Tony was asked to explain a little bit about the instrument. The melody strings can sound almost like a harpsicord at times, although with a set of effects pedals you can get it to sound like just about anything. But it's that deep, resonant, percussive bass that made me fall in love with the Stick and I'm amazed how popular it is (and how many people comment on the sound) when I use it during FAWM and Fifty/Ninety. And finally - if you've ever seen the David Lynch film "Dune" you may remember Patrick Stewart played Gurney Halleck. The first time we see Mr Stewart in the film here, he's carrying Gurney's baliset - and if you look closely, you'll see the prop in the film was a customised Stick. So, who's who in the world of the Stick? This is the official website of Stick Enterprises, the folks who make the Stick. Emmett Chapman is very supportive of the instrument he invented, and the people who play it. When I first wrote off for information on the instrument, I was amazed to receive a handwritten reply from Emmett himself. Understandably, he's also an amazing Stick player. I have his "Hands Across the Board" VHS video which is well worth watching. Hey - I went and saw Kajagoogoo many years ago, and yes, I was at least ten years older than anyone else in the audience, but here was this chart-topping band who actually had a Stick player, and who were getting coverage on TV. Of course I was going to give them my support! Since the days of the Kaja's Nick has been working steadily, building up a huge reputation in the prog rock world as a go-to player for bass and vocals. He's recorded with Robert Fripp; he's toured with Steven Wilson, he's toured with Steve Hackett, and he's toured with Kim Wilde. He still does all that, but now it won't be long before The Mute Gods arrive. I can't wait! In recent years Trey has been "seduced by the dark side" and moved away from 100% Stick work, but he still wields a mean baliset. Apart from his work with the highly esteemed Mr Fripp in projects from "The Bridge Between" to "Damage" (which also features David Sylvian and Michael Brook) and several of the many incarnations of King Crimson, Trey has worked with artists as diverse as Michael Manring, Jerry Marotta, TOOL, Pat Mastelotto, and Finnish accordionist Kimmo Pohjonen. He composes music for film and TV, and has also issued a number of excellent solo albums over the years: One Thousand Years and The Third Star, are favourites of mine and are both on the Discipline Global Mobile label. If you saw the late lamented John Martyn on one of his last excursions, or perhaps saw him playing live on VH-1, you probably noticed that he had a Stick player in his band. That's Jim - he also has a couple of albums out which you really should listen to. Jim does a lot more than just play Stick, though - head over to his website to find out more. Tony was the man who started me off on Stick, after I saw him playing for King Crimson and Peter Gabriel. Tony has a prolific recording career, ranging from his own solo albums to projects with Bruford Levin Upper Extremities, as well as session work for everyone from Pink Floyd to John Lennon, from Joan Armatrading to the California Guitar Trio, from The Roches to Rosie Vela. He's also a really nice bloke - I've met him a couple of times. A real Internet enthusiast, Tony keeps his site frequently updated and it's well worth a visit. He takes photos of the audience at nearly every gig he plays, and sometimes I've spotted myself in them - the best being on the Stick Men tour back in June 2012. It was Tony's birthday that day, too - scroll down past the cake... Quite a few of the what to do with my badly-printed CD booklets suggestions are from me. And you should definitely get a copy of Tony's book, Beyond the Bass Clef: The Life and Art of Bass Playing which is available from his site. It's a fascinating read. You might have seen Carrie playing bass and Stick for Mike Oldfield on "Later with Jools Holland". She's also toured with Bristol's finest, Tricky. Carrie was also the bass player in Babylon Zoo; remember "Spaceman"? The first time I saw these folks (a long time before they got the gig plugging Intel's Pentium 3 processor) was when David Letterman's The Tonight Show was being broadcast on British TV. I can't even remember what channel it was on, but I do remember a set of strange blue people who appeared to be performing as the KLF's backing group. With a line of stick players playing for them. Not one, not two or three, but lots of stick players. By the time they'd finished, the theatre was completely covered in computer printout paper, Letterman was losing the plot because he was being prodded and stared at by three blue guys, and I was flat on the floor in amazement. Yea verily, it was a night that shall go down in Stick-playing history. Since then I've acquired several DVDs and Blu-Rays of their live performances and a couple of CDs. I'm a big fan. There isn't another band like them on this planet. For a taste of what they're like, the Complex Rock Tour Live DVD is well worth getting hold of.